Recently, Big Ant Studios launches a new Big Bash Cricket game named as Big Bash Boom for PS4, Xbox One, Nintendo Switch, and PC, in collaboration with Cricket Australia. For mobile players, a new Big Bash Cricket game has also announced. And, it’s from the developers behind the WCC2 game. It’s in beta as of now and available for download from Google Play Store. 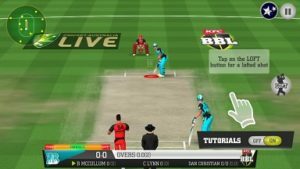 The new Big Bash Cricket game features four game modes; quick play, super over, multiplayer, and tournament. In the multiplayer mode, you must have an active internet connection. Before you proceed, you have the option to choose the team; women cricket/men cricket. Make sure to choose the home club wisely, as changing the home club costs you 300 gold. You can earn gold by playing the tournament mode. The tournament mode unlocks after playing three matches in the quick play mode. In the quick play mode, you have four options; 2/5/10/20 over matches, day/night mode options, and three difficulty modes; easy, medium, and hard. You can also activate the boosters before proceeding into the match. You can buy these boosters from the store, in exchange for 50 gold. There are two types of boosters; power hit and special delivery. Activating the power hit shot lets you hit more boundaries in the match. And, special delivery booster enhances the bowling performance of the bowlers. These boosters last long for about 100 balls. In the online multiplayer mode, you will compete against other players for the top rank. The multiplayer mode is similar to Nextwave’s previously released cricket game Chepauk. The player with the most runs at the end wins much better rewards. You spend coins in the new Big Bash Cricket game as an entry fee. Use the gold for boosters, special FX. The special FX changes the ball look/animation in the match. These special effects include thunderbolt, golden, silver streak, epic cool and the red dragon. Head to the store -> special FX -> tap the eye icon for the preview. You can earn coins by playing the game, by watching the video ads. For gold, play the tournament mode. The graphics of the game are OK. Player’s animations, controls are good. Since it’s in beta, you may see improvements in upcoming updates. The new Big Bash Cricket game is now available for free to download on Google Play Store.